“Make A Difference” with the Virginia Jaycees! Help restore the native Virginia Oyster, the health of the Chesapeake Bay & save the Watermen’s heritage and culture through this unique and powerful private sector initiative with ﻿the Virginia ﻿Jaycees “Oysters for Life”﻿﻿ campaign! Through a specially designed package, each “Virginia Jaycees/Oysters for Life” package sponsored one time for $175 provides two baker’s dozen of fresh Virginia oysters to be delivered to the Virginia Jaycees Chapter/Region or State for their seafood fundraiser every year in perpetuity! For every 1000 oyster cage packages sold, that’s 26,000 Virginia Oysters helping to raise funds for the Virginia Jaycees each year! 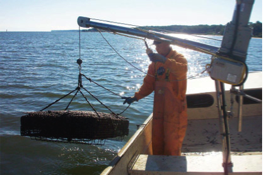 Each package provides the funds to build an oyster cage, supply the oyster seeds, co op with a watermen’s family for creating sustainable jobs while helping to restore the native oyster population and accelerating other fish and reef habitat! These cages act as mini reefs! You will make a difference…for all the right reasons!... Free market enterprise, eco-friendly, creating independence and leaders without grants or Government funding…not adding to the national debt! PURCHASE “Oysters For Life” through the Virginia Jaycees web site or links through your Chapters or Region - “Va. Jaycees/Oysters for Life” Icon! Register you and your supporters (new members/local businesses/other friends/family) to support your campaign! Each “Virginia Jaycees/Oysters for Life” package comes with a beautiful OFL Certificate with the name of the member/new member/family/friends/businesses, etc), including a unique Virginia Jaycees Cage number that will be placed on the oyster cage and transferred when a new cage is required! Therefore, each one time support will last in perpetuity! THANK YOU and click here to make your purchase!